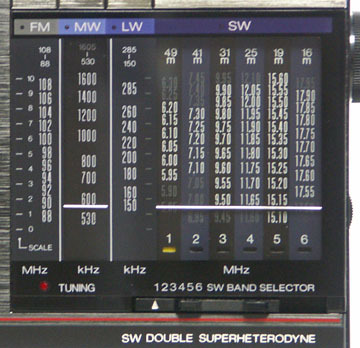 The Panasonic RF-B20 covers longwave 150-285 kHz, AM from 530-1610 kHz, and six shortwave bands: 5950-6200, 7100-7300, 9500-9900, 11650-12050, 15100-15600, 17550-17900 kHz plusd FM from 88-108 MHz. This radio features a double conversion circuit, analog display and 2.5 inch speaker 8 ohm. This radio has a power lock button, DX-Local switch and LED tune indicator. There are external jacks for earphone (3.5mm mono 8 ohm) and 4.5 VDC in. Operates from three AA cells (not supplied). 6.5 x 3.55 x 1.2 inches 12 oz. (165x90x28mm 320g). This is a step-up model from the pocket sized RF-B10. 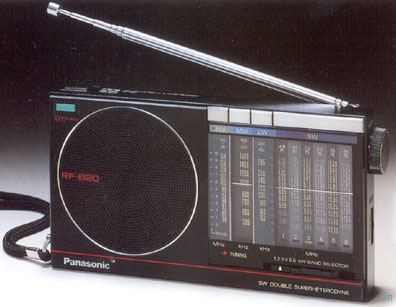 The Panasonic RF-B20 was sold as the National RFB-20L in some parts of the world. Copyright 2006-2010, Universal Radio, Inc.